The Model “B” is like the “C” model, except certain features are optional, so you can add just the features you need. “B” & “BX” models feature a fixed height conveyor and precision head/blade height adjustment. These resaws are excellent for resawing random-width material, sizing cants, and many other applications. Thin-kerf technology and the Baker Low Profile Flat Guide System generates up to 60-70% less sawdust and up to 25% more boards, easily outproducing a gang rip. 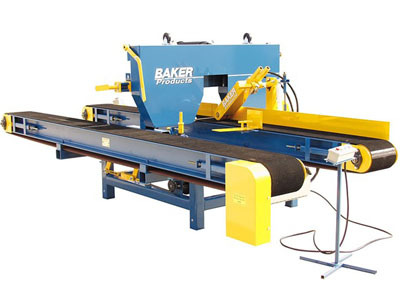 Baker Multi-head Band Resaws are made of a heavy-duty construction and are simple to maintain and operate. They can be built with as many heads as your production requires.